Pottery painting at Centerparcs - we loved painting together! Pottery painting at Centerparcs is lovely as it is typically quite a gentle activity and if you don’t want to spend lots there are pieces starting from under £10 to paint. You cannot book activities at Centerparcs until six months before the month of your visit. However, once activities are open for booking the price you pay upon booking will not change. This makes it ideal for budgeting for your holiday as you can spread out your bookings before you enjoy your holiday and you can just book one activity per week to month before you go. This particular activity is £5 at present and this has remained unchanged for more than 3 years now. Your £5 usually gets you 1.5 hours in the pottery painting studio. This fee is the studio fee for the time there and the paints, you need to buy your item to paint. Once you arrive at the pottery painting studio you can make your selection and choose an item to paint. Items are priced individually. You pay for your item when you finish. You can paint as many or as few items as you want, as long as you loosely stick to your 1.5 hour slot that you have booked. However, I should point out that if you need to go over this isn’t usually a problem as I’ve never seen the pottery painting studio fully booked. If you want to paint one item as a family then this is fine. There are plates, initials, various ornaments and lots of seasonal items. They have goodies for Halloween, Christmas and more. Most of the items have a painted example to give you an idea of what to expect. There are photo frames and much more on offer as you can see in the below photo. You are seated at a table and there is a square plate, with each of the paints on it. This shows you what the end result will typically be once your item has been fired in the kiln. This is fantastic as often the paints look a little different once fired than they do when you’re painting with them. 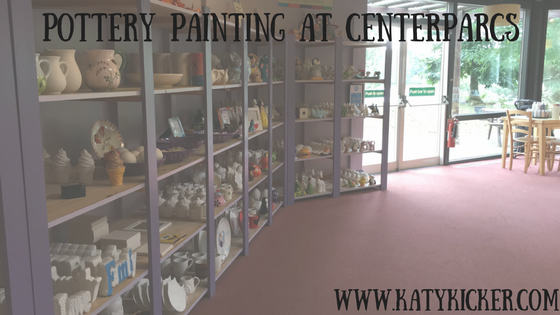 If it is your first visit to the pottery painting studio at Centerparcs then the staff will talk you through where you can find stencils, sponges, pens and much more. There are lots of items on offer to help and it is recommended that you paint three layers of each other, to give the best results from the kiln firing. We chose to paint a bear for Daisy, which was also a piggy bank. We gave all areas three coats and we chose to use paint that had flecks within it. When painting these looked grainy but the end result was lovely – we think so anyway! We have participated in pottery painting at Centerparcs at least 3 or 4 times now. It is an activity that we love! We’ve painted a gnome, flowerpot, cookie plate and more. We find it a really relaxing start to our holiday. Visiting the studio on our last day to collect our item is fun. It is always exciting seeing just how the item has turned out and this is always a really lovely end to our holiday. We will be visiting Centerparcs again in just a few short weeks. We’ll look forward to visiting the pottery painting studio again I’m sure. We love that our home has lots of items within it that we have painted together. We are not the neatest painters, as you can see from above. Our item is unique and that is fun! Items start from £11. This is on top of the fee that you pay to book your pottery painting. This fee is for the studio time. Then you pay for the items you paint. You paint the items and then return the following day when they have been fired in the kiln and are ready for collection. If you and your family are off to Centerparcs then why not check out some of my Centerparcs YouTube videos? Previous Article Reduced movements – would you notice? Next Article Dairy free fruit pancakes – Free from soya too!